All-in-one disinfectant, sanitizer and cleaner is highly effective against HIV-1 (AIDS virus), hepatitis B and C, MRSA, avian influenza (bird flu), athlete's foot fungus, influenza A and many gram-positive and gram-negative bacteria. Suitable for use in hospitals and food processing facilities. Dilutes 1:16 for heavy cleaning, 1:64 for cleaning and disinfecting, and 1:128 for sanitizing. One-step disinfectant, cleaner, deodorizer and sanitizer with a high level of active ingredients. Extensive efficacy list including Hepatitis B and C, Human Corona virus, Canine Distemper Virus and Avian Influenza. Blood born pathogen compliant. EPA rated for use in kennels, cages, veterinary hospitals and other animal areas. 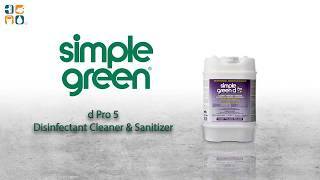 Excellent for hospitals, nurseries, nursing homes, office settings, break rooms, kitchens, bathrooms and other areas that need a safe environment for family, staff and friends, while leaving our planet green.